Apetrei, R., Catrinescu, C., Mardare, D., Teodorescu, C.M., Luca, D.
(2009) Thin Solid Films, 518 (4), pp. 1040-1043. Kulisch, W., Gilliland, D., Ceccone, G., Sirghi, L., Rauscher, H., Gibson, P.N., Zürn, M., Bretagnol, F., Rossi, F.
(2009) Journal of Vacuum Science and Technology B: Microelectronics and Nanometer Structures, 27 (3), pp. 1180-1190. (2009) NATO Science for Peace and Security Series B: Physics and Biophysics, pp. 509-524. Kulisch, W., Freudenstein, R., Ruiz, A., Valsesia, A., Sirghi, L., Ponti, J., Colpo, P., Rossi, F.
(2009) NATO Science for Peace and Security Series B: Physics and Biophysics, pp. 3-34. Stan, C., Cristescu, C.P., Alexandroaei, D.
(2009) Czechoslovak Journal of Physics, 54 (SUPPL. 3), pp. C648-C653. Apetrei, R., Negrilǎ, C., Macovei, D., Dǎscǎleanu, V., Teodorescu, C.-M., Mardare, D., Luca, D.
(2009) Nanotechnology 2009: Fabrication, Particles, Characterization, MEMS, Electronics and Photonics – Technical Proceedings of the 2009 NSTI Nanotechnology Conference and Expo, NSTI-Nanotech 2009, 1, pp. 375-378. Borcia, G., Borcia, C., Dumitrascu, N.
(2009) Romanian Reports of Physics, 54 (7-8), pp. 689-697. 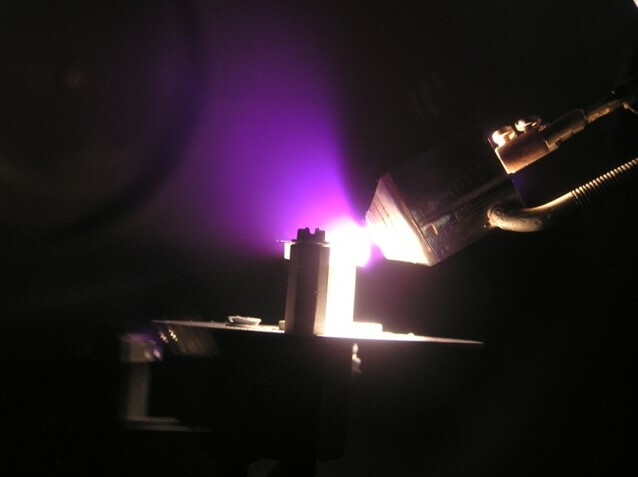 Chiper, A.S., Rusu, B.G., Nastuta, A.V., Popa, G.
(2009) IEEE Transactions on Plasma Science, . Article in Press. (2009) Nanotechnology, 20 (36), art. no. 365702, . Tiron, V., Andrei, C., Nastuta, A.V., Rusu, G.B., Vitelaru, C., Popa, G.
(2009) IEEE Transactions on Plasma Science, 37 (8 PART 2), pp. 1581-1585. Stan, C., Cristescu, C.P., Alexandroaei, D., Agop, M.
(2009) Chaos, Solitons and Fractals, 41 (2), pp. 727-734. (2009) IEEE Transactions on Plasma Science, 37 (6 PART 1), pp. 941-945. Kulisch, W., Popov, C., Gilliland, D., Ceccone, G., Sirghi, L., Ruiz, A., Rossi, F.
(2009) Diamond and Related Materials, 18 (5-8), pp. 745-749. Topala, I., Asandulesa, M., Spridon, D., Dumitrascu, N.
(2009) IEEE Transactions on Plasma Science, 37 (6 PART 1), pp. 946-950. Kylián, O., Benedikt, J., Sirghi, L., Reuter, R., Rauscher, H., Von Keudell, A., Rossi, F.
(2009) Plasma Processes and Polymers, 6 (4), pp. 255-261. Sirghi, L., Ruiz, A., Colpo, P., Rossi, F.
(2009) Thin Solid Films, 517 (11), pp. 3310-3314. Ceriotti, L., Buzanska, L., Rauscher, H., Mannelli, I., Sirghi, L., Gilliland, D., Hasiwa, M., Bretagnol, F., Zychowicz, M., Ruiz, A., Bremer, S., Coecke, S., Colpo, P., Rossi, F.
(2009) Soft Matter, 5 (7), pp. 1406-1416. Iftimie, N., Luca, D., Lacomi, F., Girtan, M., Mardare, D.
(2009) Journal of Vacuum Science and Technology B: Microelectronics and Nanometer Structures, 27 (1), pp. 538-541. Sirghi, L., Bretagnol, F., Mornet, S., Sasaki, T., Gilliland, D., Colpo, P., Rossi, F.
(2009) Ultramicroscopy, 109 (3), pp. 222-229. Chiper, A.S., Nastuta, A.V., Rusu, G.B., Popa, G.
(2009) Nuclear Instruments and Methods in Physics Research, Section B: Beam Interactions with Materials and Atoms, 267 (2), pp. 313-316. Tiron, V., Dobrea, S., Costin, C., Popa, G.
(2009) Nuclear Instruments and Methods in Physics Research, Section B: Beam Interactions with Materials and Atoms, 267 (2), pp. 434-437. (2009) Nuclear Instruments and Methods in Physics Research, Section B: Beam Interactions with Materials and Atoms, 267 (2), pp. 442-445.